Brainstorming is key to teamwork. You can’t make team decisions without brainstorming ideas first. Also, in the absence of brainstorming sessions, solving problems would be a lot less effective. Yet, effective brainstorming is not an easy thing to do. That’s why I want to help you. Here are 8 different techniques that modern entrepreneurs and their prolific teams use to make your brainstorming sessions more effective. Each brainstorming session is focused on a central topic. Make sure you know exactly what it is and also what you’re trying to achieve through this session. What is the ultimate goal? You might not be an expert in every topic you are brainstorming, but that’s not an excuse for lacking minimal information. Do your research and make sure you’ll be able to contribute in a positive way. Announce the meeting to everyone involved in due time. Set a date and time and send the agenda to everyone, at least a couple of days in advance. That way they have enough time to prepare. Now, let’s move on to the actual meeting and discuss some proven techniques that will get you the results you need. There is no need to evaluate ideas from the beginning. Actually that is counterproductive, since criticism might stop people from speaking up their minds. Don’t tear down any idea, no matter how unusual they might sound. That’s how innovation usually starts. Make sure there is room for everyone to voice out their opinions. Stand in a circle and take rounds, allowing everyone to share. In the meantime, you or someone else from the team should write down these ideas for future references. This is when you revisit ideas and suggestions. Analyze what would and wouldn’t work; which ideas to push forward and which to discard. Select the best ones and make a plan to implement them. Classical brainstorming sessions can be a success. There is no reason why you wouldn’t be able to find some good ideas and smart ways to make them happen. However, this is definitely not the best you can do. 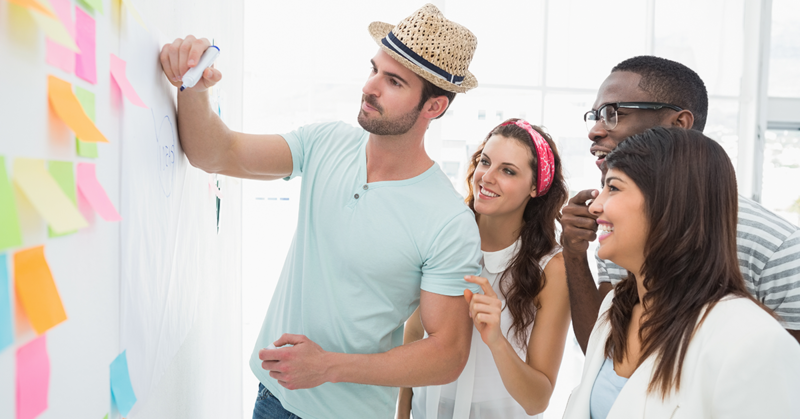 Scroll down to learn how to make your brainstorming sessions even more effective. People are more productive and creative when forced to step outside their comfort zone. Rent a conference room in a nicer office building, or any other type of venue that would stimulate the creativity of your team. Stand-up meetings are much more effective than regular sit-downs. Pushing people outside their comfort zone forces them to keep their focus sharp and be present. Besides that, standing on their feet is an incentive for people to keep things short and avoid deviations from the subject. Ask each participant to write down an idea on a piece of paper. Give them a minute to think about it and write it down. Then tell everybody to pass the note to the person on their right (or left), who will have to add something to it. Continue passing over the notes until they get back to the person who initiated the idea. Sometimes it is hard to analyze an issue if you (including your team) are too attached to it. To see things in perspective, you need to create a new context. So use a role-playing game, the “what would [famous person] do?” type. For example, if we are talking about a business decision, what would Steve Jobs do? Play the role of a successful entrepreneur and come up with ideas as if you were someone else. Use different points of reference for a more diverse palette of experiences – how would you handle things if you were of different gender, from a different geographical area or in a specific point in the timeline? What could you have done differently 10 years ago? Or how would you go about a situation in 10 years from now? Since brainstorming focuses on quantity rather than quality, you should do everything in your power to get as many ideas as possible. One of the most effective ways to do that is through rapid ideation: give every participant a piece of paper or a bunch of post-its and ask them to write as many ideas they can come up with in a given time (anywhere between 5 and 15 minutes). When the time is up, gather all the papers back and stick them on a board, so you can discuss them together. Most people are more creative when they can actually visualize the ideas they are discussing. No wonder so many presentations contain images or other graphics. Use a projector to show images of the things you are discussing or at least similar to those. Team collaboration apps are amazing tools for effective brainstorming. Virtual teams are allowed to share ideas with all members at once, and keep them safe for future reviewing. They also make things easier for the introverts in your team and people who are not usually comfortable with speaking up. Some topics are more sensitive than others and not everybody is at ease when sharing things that might reveal personal information they would rather keep to themselves. So, at the end of the meeting, it might be a good idea to ask everyone to write down ideas on a piece of paper anonymously. That way, people are more likely to share ideas that might not seem that good at first, but could eventually change the faith of a project or product. Keep in mind that no idea is a bad idea and where some see trash, others might see gold. All in all, I invite you to experiment with these advanced techniques and share your experience with us in the comments section. We also encourage you to share any other brainstorming techniques that you are effectively using in your company.